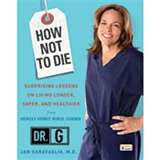 Dr. G, Medical Examiner, offers insights in this gory yet fascinating discussion of her autopsies. Among the nuggets: don't drive with your windows down (in a wreck your chances of survival are better staying inside the car, and the windows down makes it easier to be sucked outside) and that she drives around the block rather than make a left turn in traffic, because they are so dangerous. Recommended only for those with strong stomachs and an overwhelming desire to find out about dead bodies. thank god, no. The descriptions were bad enough. I love her show, but I don't know if I could stomach the book. My sister in law once loaned a forensics book to me. It was full of the most gruesome photos and I could not stop looking at them. It really was the worst book I have ever read. Your post reminded me of it - I cannot imagine why my SIL thought I might like to read it. I love this show! Book sounds interesting! Was interesting...luckily there were NO illustrations.